Unquestionably, the best moment in “The Fifth Estate” comes at the very end of the film when it offers a rebuttal from its subject. Not the real subject, mind you, but Benedict Cumberbatch in his portrayal of WikiLeaks founder an internet activist/anarchist Julian Assange. Framed as a talking head, documentary-style interview, in character Cumberbatch decries “the WikiLeaks movie” as “the anti-WikiLeaks movie” that is based on two books filled with lies. Casting doubt on the movie we’ve just seen from within the context of that same movie is an interesting idea, which probably would’ve been even more effective had “The Fifth Estate” been otherwise interesting or engaging in any way. For a film that chronicles the rise and partial fall of a rogue, dangerous and controversial media outlet, it sure feels routine and tired. There is no palpable tension, any potential for intrigue zapped by unclear writing or, worse, writing so clear everything is explained away in boring fashion. Assange boldly posted millions of critical and classified documents on his website – from financial institutions, governments, and any other leads he could get – in unedited fashion. Director Bill Condon’s film, unfortunately, plays it safe by staying firmly planted in a middle ground where the thrill of posting the documents and getting one over on someone is offset by a benign scolding from Assange’s opposition. There’s never a sense of real stakes. Telling us that “real people could be hurt” or showing a government official needs a stiff drink to deal with the fallout isn’t enough. There are some forced frenetic flourishes thrown in to give the illusion of action, but abrupt location captions and floating chat logs aren’t enough to add forward momentum. Almost working is the virtual office world used to portray the intangible WikiLeaks workspace. It beats watching people stare intently at their laptops and type furiously (which there is a lot of as well). The site of Daniel smashing it is the only moment of real emotion that connects. Other supporting characters and performers barely register. Great actors like David Thewlis as a British investigative journalist, or Laura Linney and Stanley Tucci as Washington, DC power brokers are completely wasted. I’m still not even sure who Linney and Tucci were supposed to be. The entire scope of the blowback from WikiLeaks in Washington feels like an aspect to the story the filmmakers weren’t interested in at all but had to include for posterity’s sake. Similarly, Daniel is given a love interest (Alicia Vikander) only so she can vocalize her displeasure with his following of Assange. 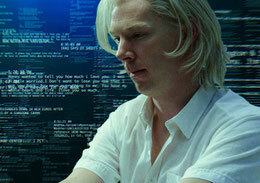 Purpose is completely lacking in “The Fifth Estate.” From the Ecuadorian Embassy in London, which has been protecting him for the past year, Assange (the real one) called the film “a reactionary snoozefest that only the U.S. Government could love.” I think he’s half right – I’m not sure anyone could love it.